PayPal is a faster, easier, more secure way to accept and make payments online. Whether it's preventing problems or knowing what to do in case something goes wrong, here's how to protect yourself from online hazards and make secure payments with PayPal. Using PayPal you don't need a cash balance to pay for a purchase, instead you can safetly store bank details and credit card. Choose the one you want to use each time you pay for your online shopping. PayPal will then safetly draw on your card or bank account it each time you use it. If you link your rewards credit card to your PayPal account then you will still earn points when you check out with PayPal. SelectProfile towards the top of the page. Select Update beside "Credit and Debit cards." Click Add card or Add another card and follow the prompts. Click Profile towards the top of the page. Click Update beside "Bank accounts." Click Add and complete the required details. Click Update beside 'Credit and Debit cards'. Click Edit or Update expiry date under ‘Action’. Enter your new expiry date and click Save. Click forgot? at the ‘Password’ section. Enter the email address you used to create your PayPal account. Enter the security code shown and click Continue.. Confirm account ownership by selecting and entering the information you want to verify. As a PayPal customer, our goal is to make sure your financial details and information are as secure as possible. So when you're new, we ask you to follow steps to confirm that the bank account or card attached to your PayPal account is actually yours. This is called, getting verified. You don't need to verify your bank account or credit or debit cards until you reach the sending or withdrawal limits we initially place on your account. Add your bank account to your PayPal account. 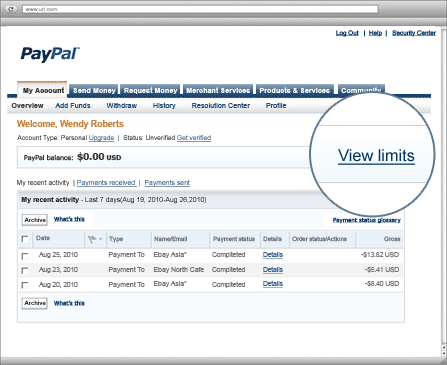 Log in to your PayPal account and click View Limits and follow the prompts. Look for two small deposits from PayPal into that account (they'll appear on your statement in 2-3 business days). When you've received the deposits, log in to your PayPal account, click Confirm my bank account in Account Overview, and follow the prompts. Add your card to your PayPal account. 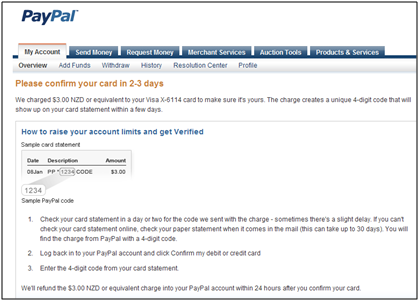 Look for a $2 - $3 charge from PayPal to your card (it will appear on your statement in 2-3 business days). When you see the charge on your statement you'll notice it's been given a unique 4-digit code. Enter this code into PayPal by logging in to your PayPal account, clicking Confirm my credit or debit card in Account Overview, and following the prompts. We'll refund the $2 - $3 charge into your PayPal account within 24 hours of you confirming your card. Note: Account verification is different to Proof of identity, which is the process where we are required to confirm the PayPal account holders identity. Why is verification important? When you first open a PayPal account, there is a limit on the amount of money you can send-usually around $2000. Once you reach your limit, you'll need to add a bank account and become Verified in order to continue making transactions. You can view your sending limit in your Paypal account. 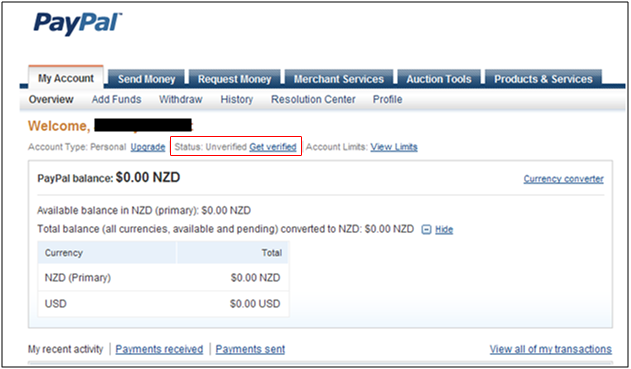 When you log into PayPal your account will either say "verified" or "unverified". If it is unverified PayPal gives you simple steps to follow to verify your account. Just Add and Confirm a Bank Account. PayPal will send your account two small deposits. Enter these deposits on the PayPal website. Answer a quick confirmation phone call from our third-party authentication service to validate your information, and you're all set. Provide PayPal with your info. They will make two small charges to your card. 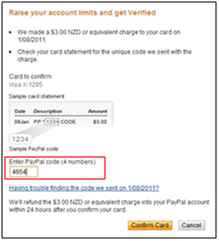 Return to PayPal and enter those charges along with the adjacent code as they appear on your credit card statement. PayPal will reimburse you for the charges and you’ll be Verified. Check your credit card and billing address details are correct. The billing address must match the address that your credit card statement is sent to or the one provided to the bank for your credit card. Click on the "Continue" Button which will initiate the charge to your credit card / Bank Account. After a few days, please check your bank account / statement to get the 4-digit verification code. Once you have the verification code from your statement, login to your PayPal account and click on the "Get Verified" link again. You will get the following message which will allow you to enter in that four digit code and confirm your card. It's fast, easy, and PayPal can guide you through each step. Click Update beside 'My Preapproved payments'. Locate the Recurring Profile you wish to update, and click on the link. 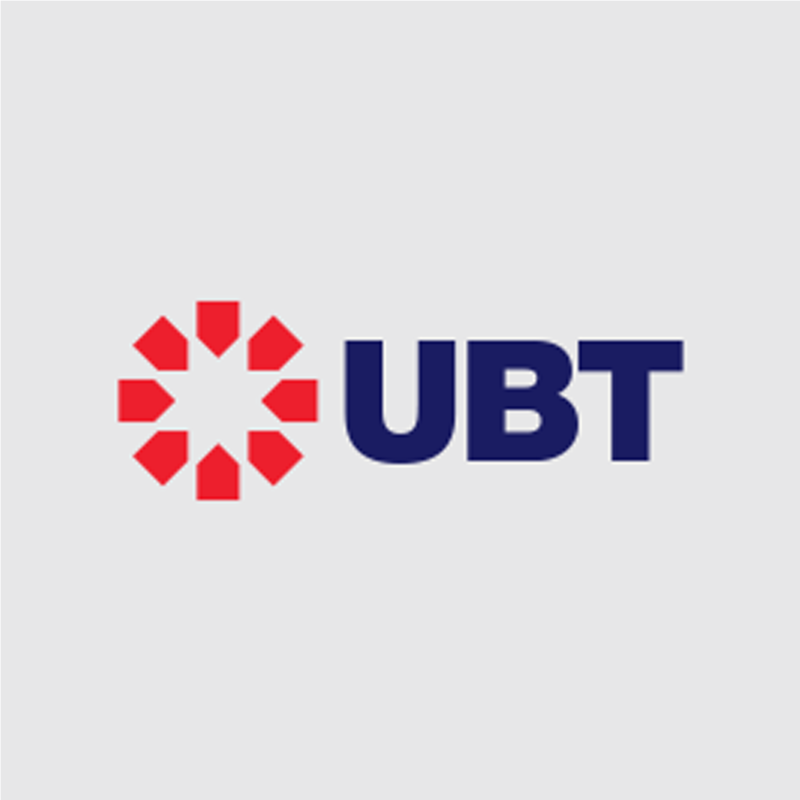 Check the Backup payment method is the credit card you choose to use for that profile. Click Change if you would like to set a payment method for this, or change the payment method that is there. Select the payment method you wish to use for this profile. Click Save. If the correct payment option is not showing, you will need to add this option to your PayPal account. See above.